In small bowl, mix crust ingredients. Press firmly in bottom of ungreased 9- or 8-inch springform pan; refrigerate 10 minutes. Spoon sorbet over crust; spread evenly with metal spatula. Freeze 30 minutes. In large bowl, mix thawed strawberries, using wire whisk, until broken into small pieces. Beat in margarita mix until well blended. Fold in whipped cream. Carefully pour into pan over sorbet. Freeze at least 3 hours until firm. Using 4-inch wooden skewers, place strawberry half and mango slice on each of 10 skewers. Sprinkle with coarse sugar. Place skewers into top of dessert for garnish. To serve, cut into wedges. Substitution: Try using lemon sorbet instead of the mango. 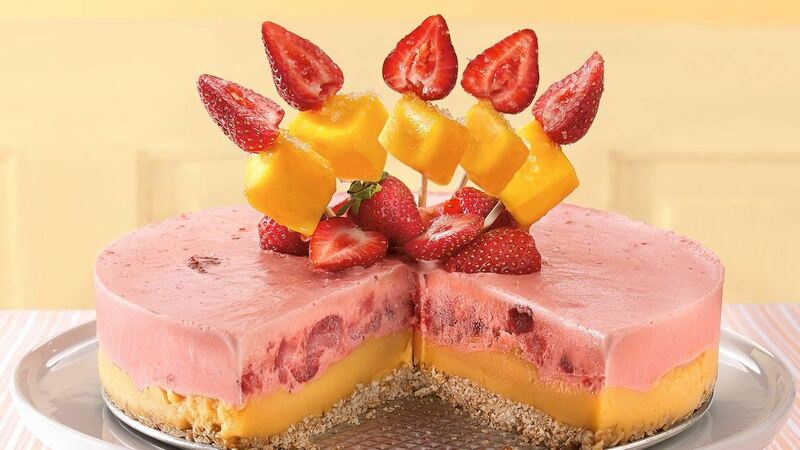 Tip : To make cutting the pie easier, wait to place the fruit skewers in the dessert until after slicing it.